H.G. Wells on the first encounters between modern humans and Neanderthals. See also The Neanderthal problem and Neanderthals dumb? The Grisly Folk: ... But one may doubt if the first human group to come into the grisly land was clever enough to solve the problems of the new warfare. Maybe they turned southward again to the gentler regions from which they had come, and were killed by or mingled with their own brethren again. Maybe they perished altogether in that new land of the grisly folk into which they had intruded. Yet the truth may be that they even held their own and increased. If they died there were others of their kind to follow them and achieve a better fate. 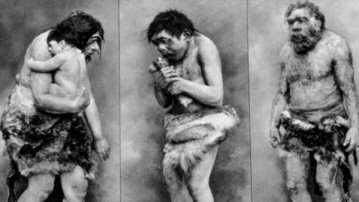 The Neandertalers, albeit not so erect and tall as men, were the heavier, stronger creatures, but they were stupid, and they went alone or in twos and threes; the menfolk were swifter, quicker-witted, and more social — when they fought they fought in combination. They lined out and surrounded and pestered and pelted their antagonists from every side. They fought the men of that grisly race as dogs might fight a bear. They shouted to one another what each should do, and the Neandertaler had no speech; he did not understand. They moved too quickly for him and fought too cunningly. Razib Khan discusses other examples from this genre.